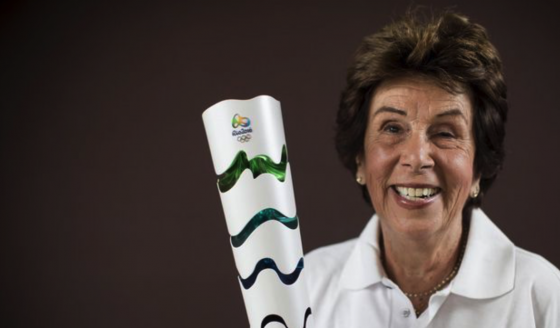 Maria Esther Bueno’s story began in Sâo Paulo, Brazil where she was born on 11th October 1939 into a tennis-playing family. Her father was a business man who adored the game he kept playing until he was well into his eighties. The gentlest of men, both on and off the court, he was renowned for his impeccable lob and competitive spirit at a club level. 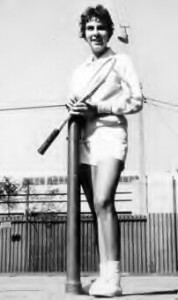 Maria’s mother also played social tennis, so it was natural that she and her elder brother of two years should share their parents’ interests. 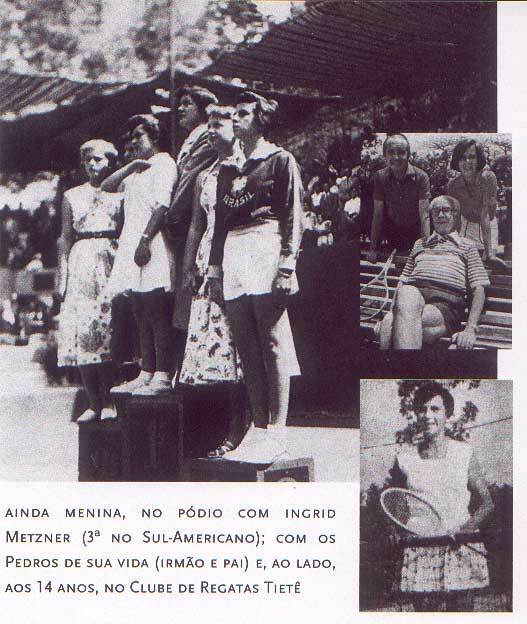 Living in a house just across the street from the Clube de Regatas Tiete in Sâo Paulo, the Bueno family spent most of their spare time there, so it was inevitable that baby Maria would grow accustomed to the sound of bouncing tennis balls. It was only a matter of time before Pedro and then, a little later, Maria were playing with tennis balls and wielding rackets themselves. Rackets were handed down the line from father to mother, mother to brother and finally to Maria who learnt to hit the ball solidly with an extremely heavy racket for her age and build. Pedro became a fine player in his own right representing his country in the Davis Cup and playing on the circuit, but he was never to reach quite the heights that Maria did. He gained his Davis Cup colours before he was twenty and won the South American Junior Championships three times. 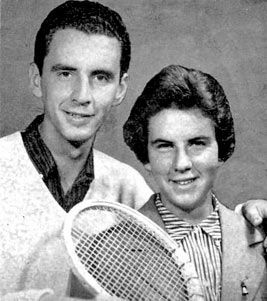 In 1958, the year his sister hit the international headlines, Pedro won the USA Inter-Collegiate Championships as a student of Lamar State College in Beaumont, Texas. His style was different to the game developed by his sister. A natural base-liner, Pedro had the immaculate ground-strokes consistent with a good, patient clay-court player. In contrast, Maria was a net-charger with an almost impatient, aggressive game that was honed into a variety of killer shots. Modelling her service action from a picture of Bill Tilden in a book, Maria used her eyes well to observe how all the good players hit the ball. She received no formal coaching but taught herself, using her natural ability and extraordinary talent to play her way up through the club leagues and attain the top spot on the number one court as a junior. Playing mostly with the men, her final opponent on the ladder actually defaulted rather than lose his ranking to a mere girl. Maria won pretty well all that mattered as a junior, playing at home in Sâo Paulo, all over the state and nationally before competing in the Pan American Games in 1955 in Mexico. She won both the Brazilian Senior Nationals and the Under 14s in 1954, adding to her already growing tally of titles in the Under 18 and the Under 21 categories. 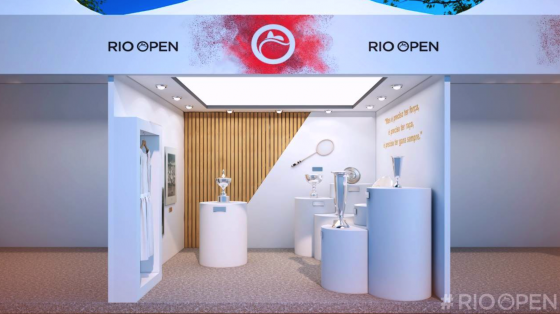 Word was getting around and when top players from abroad came to Sâo Paulo, Maria’s talents were put to the test against some of them in exhibition matches. 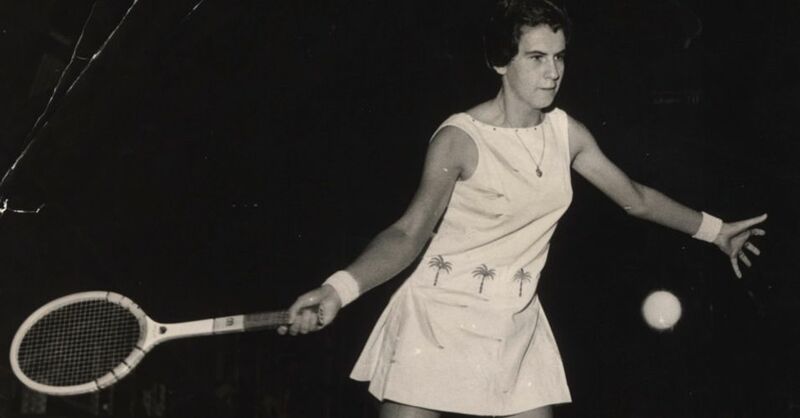 Where others were being soundly trounced, Maria was taking sets off the likes of Shirley Fry. 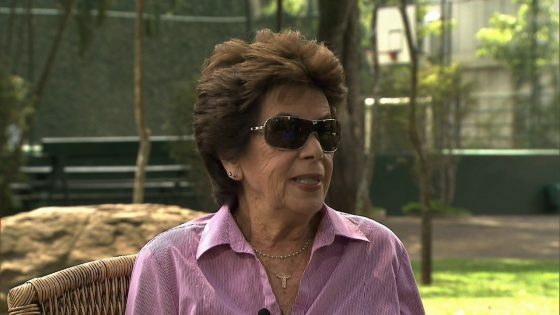 She also won a set off Althea Gibson in the final in Caracas in 1958. It gave her a taste of what could be, and a growing conviction within herself that she could be the number one in the world. Certainly it was becoming clear that here was a very unique talent that needed to compete further afield, especially as local competition was not stretching Maria enough. 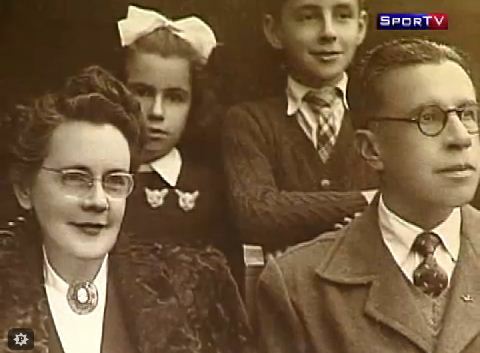 And so, in late 1957, Maria set off at the tender age of 17 to play in the Orange Bowl in Florida and the Caribbean, leaving her family on whom she was so very dependent behind. She travelled alone on a one-way ticket donated by the club. As Maria burst onto the international circuit experts whispered words like ‘genius’ while others, less charitable, said ‘lucky to be born with such abundant talent’; but, according to Jimmy Jones in Lawn Tennis Magazine, the truth lay elsewhere – remembering the truism ‘genius is 10 per cent inspiration, 90 per cent perspiration’. The month preceding Maria’s world tour in 1957-58 exemplified this saying. In it are to be found most of the reasons why this dynamic, then 18½ year-old Brazilian wonder was already one of the top players in the world. 9 pm: Go to bed. Is it any wonder that during that month Maria, who had precious little fat to lose, in fact shed 17½ lbs? Maria’s father was very keen for her to qualify as a teacher but her tournament schedule kept her from school for one month of the year. Determined to please him and not to let the family down, she passed with honours and qualified to teach children up to the age of 14 in all subjects. 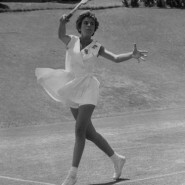 Naturally, she won the Orange Bowl at her first attempt in 1957 and it was suggested she went on to play the Caribbean Circuit where she won 14 of the 15 titles up for grabs. It was a lonely existence for a young girl who only spoke Portuguese and missed her family but she quickly befriended a group of Americans who became her travelling companions and showed her the ropes of the competitive game. 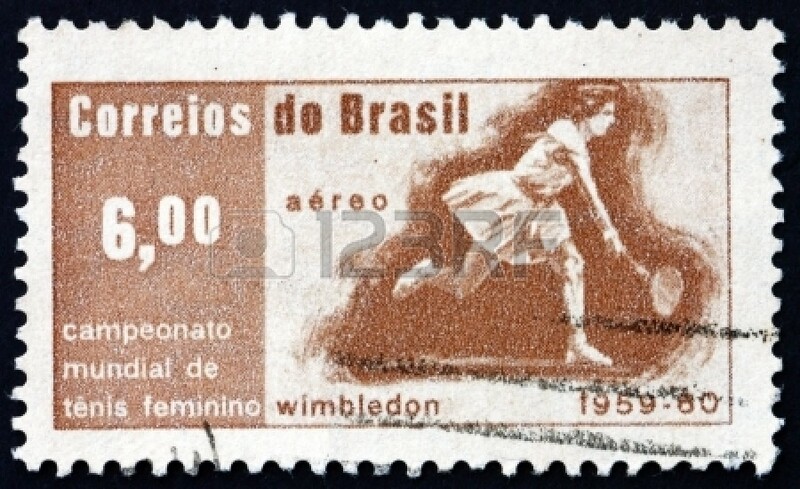 In those days it was important to win, preferably in all disciplines – singles, doubles and mixed – so an invitation to compete at the next tournament was forthcoming. This represented assured food and lodgings for the following week, however meagre. Maria was a quick learner and used the experience to increase her knowledge of the game and its surroundings to good effect. As she attracted more and more attention, it was suggested Maria should try her hand in Europe. It was to be a remarkable debut for the young girl from Brazil. Travelling around Europe second class by train between tournaments, Maria adopted a gruelling schedule that she was to maintain throughout her career. Despite the discomfort of the travel and the excitement of meeting new people and seeing new places, Maria remained focused on her goals and won the Italian Championships at her first attempt, causing a stir in Rome more akin with Hollywood stardom than the tennis court. Not since the days of Suzanne Lenglen was the public’s adoration captured in quite the same way. These were the days when women’s matches were allocated to the back courts, but Maria’s were always centre stage at the Foro Italico, set in front of a capacity crowd. Even the men’s locker room would empty as players abandoned their card games to watch her. She also collected a handful of other titles, winning the singles in Wiesbaden, Dusseldorf and Bristol before arriving at Wimbledon where she quickly established herself as an outstanding doubles player, winning, of course, 1the Wimbledon doubles with Althea. It was Maria’s first-hand experiences with life in general that led her to develop her language skills. As she developed her Spanish with her Latin American friends she also set about learning English, starting by carefully watching television and films. Finding a natural affinity for languages, she was able to add Italian and French with considerable ease and could manage some words in German. 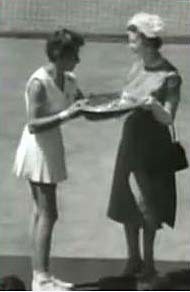 Following the success of her first trip to Europe, Maria really established her dominance and became the recognised Queen of the game in 1959 when she won the singles at Wimbledon on only her second attempt, beating Darlene Hard 6-4 6-3 in the final. diate problem was to find a dress for the Wimbledon Ball and make a speech using her new found language skills. The All England Club arranged for a dress shop to open especially for her in Wimbledon Village between her finals so one problem was solved. The more daunting was having to address the audience at the Ball, but she managed that, and opened the dancing with the men’s champion, Alex Olmedo, the Peruvian born Californian. Maria then moved on to the States and Forest Hills where she defeated Christine Truman 6-1 6-4 to take the US title. She had well and truly arrived. The press went mad, culminating in her election as Athlete of the Year in the annual Associated Press poll of 288 top American sportswriters and sportscasters. She was named World Champion, topping the top ten women’s list for the first time.